Renegade members of the French military want to assassinate French president Charles de Gaulle, and hire a British assassin to do the job. The jackal interviews with the people hiring him. It's all terribly civilized. Note the pants. But French officials get wind of the plot, and they appoint their best cop to stop him. 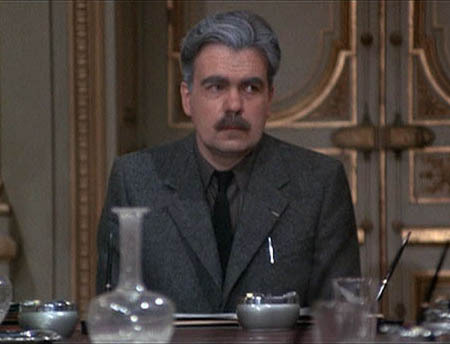 Michael Lonsdale as Claude Lebel, the cop. Note his dull clothes, befitting a flat-foot. Or perhaps his jacket matches his mustache. Fact: the cop sleeps on a cot in his office. The Jackal makes love to a rich woman in her chateau. Coincidence? Pas du tout! But the movie was made in 1973, and it was amazingly obvious how much thrillers have changed. In the first hour of the movie there are scores of tedious scenes where the assassin commissions his rifle, goes to get a fake passport, returns to get his finished rifle, returns to get his passport, etc. Meantime, the police are on the job. We get to see Top Cop ask for an assistant, then ask the assistant for them to put a cot in his office. He also has to go to a lot of committee meetings, where he delivers reports to a dozen anonymous bureaucrats in suits who smoke cigarettes and harrumph about various setbacks and the deviousness of the assassin. There are so many scenes in offices and harrumphing in smoky board rooms, that this movie could have been subtitled “The Triumph of the Civil Servants.” People smoke like chimneys throughout the whole thing, so “Day of the Chain Smokers” would have worked, too. Despite the languid pace — which includes the Jackal’s tepid affair with a married woman — The Jackal has a rather fascinating wardrobe. First, he’s got these taupe-colored high-waist pants, seemingly his only pair, and he wears them in every scene in the first half of the movie. They’re clearly miracle-pants, surviving scene after tedious scene, including scenes that are sorta action-y, with nary a wrinkle or a stain. These pants are the pride of the British Empire. They have a stiff upper inseam. 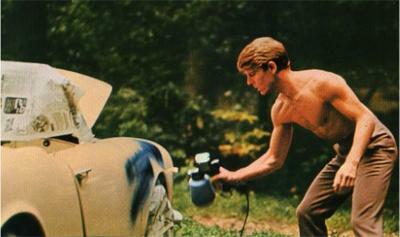 Even when The Jackal is repainting his car, his stalwart trousers are up to the task. But if he’s always wearing the same pair of pants, you ask, how can his wardrobe be fascinating? I didn’t think about counting all his cravats until well into the movie, but I’ll bet if you had a cravat drinking game, you’d be staggering drunk long before you took a shot at de Gaulle. You can also view the movie trailer online, and know the best part? 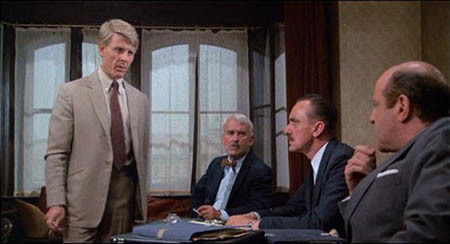 Not only is there footage from one of the committee meetings with the smoking nabobs, there’s a close-up of … one more cravat! It’s a little late to ask Santa for Christmas gifts, but next year I’m asking for taupe-colored miracle asssassin-pants … and lots and lots of cravats. This entry was posted in Books and tagged cravats, day of the jackal by John Ochwat. Bookmark the permalink. Those scenes are not ‘tedious’, it’s called building tension. It’s something thrillers used to do before dull-brained audiences started needing simpler stimulation to manage their way through a film. That’s what has changed in 30 years. A film like Le Cercle Rouge upsets today’s mass audience becaue there’s no CGI, not enough explosions (and not massive enough explosions), too much dialogue than they can process and the sentences are too long. 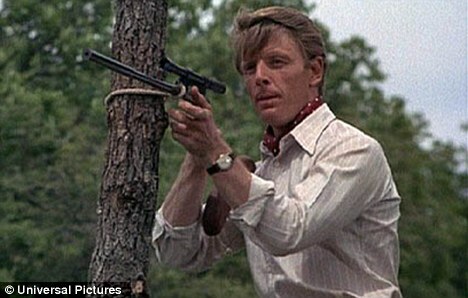 On the matter of Edward Fox’s trousers, in the first 3rd of the film he wears two colours: light tan and brown. He also wears maybe four, but no less than three jackets (note the lapel widths). At the birth certificate office he has a dark tan three-piece suit. The cravats…ah well, you got me there. It’s a cravat parade indeed.